DB840 sub in LSI15's replace the stock 8"driver!!!!! I have the DB840 in my LSi15's and drive them all day long with either my Parasound HCA-800II or even my Denon DRA-835R receiver. Perhaps it is the amp. I agree that the mids through highs are fantastic but the bass can be a bit boomy. I much prefer the bass response of my RTA-11TL's, everything else it is the LSi's. I never heard them with the stock sub. In my case, I believe that the bass is mainly due to placement but I have limitations where I can position them. I am wondering if some sort of sound absorption would work. problems. Good thing it has a 5 year warranty. One negative doesn't change the actual recommendation from Polk Audio. Not everyone will experience the same thing but 50+ have....whatever. When I worked for Polk we did this change in the chamber vs stock and it was an improvement. I also switched the speakers out and tried a few others I had... And to be honest, I didn't know how good these actually were... The other two speakers didn't have as much bass and the highs were very bright... These Polk's are good! Caution on sub woofer selection! I did not realize that Polk made an 8" DXi series until I saw their boxed DXi108 sub (it is a dvc). They also have raw DXi 8" sub (DXi804 svc and dvc) that does not show up on the web page but does appear in the DXi series Owners Manual. Here is where the confusion sets in. Comparing the specs of the DB840 svc to the DXi804 svc, as listed in each ones Owners Manuals, they look identical. However, the specs on the web site "Spec" tab for the DB840 svc are different from what is listed in its OM. Usually, I would be suspicious of the web site specs and believe the OM. However, in this case I suspect that the web is correct and the OM is wrong. I have an email into Polk CS to sort out which is correct. When I do a speaker cabinet simulation using the LSi15 sub cabinet dimensions and OM specs for the DB840, things don't look right. They look better when I use the web site specs. Bottom line, the DXi804 is likely NOT a good replacement for the LSi15 sub. Stick to the DB840. To make things even more complicated, I have a sales literature sheet for the DB series which has yet different specs for some of the parameters while others match the OM and others match the web. Take heart, some are actually consistent across all three sources. What gets me, is often when upgrading to better parts, the values actually "change", from what stock is, even when mimicking the rated values. So you're saying an 8uf cap of one brand isn't the same rating as an 8uf rating of another? Now I would agree to an extent based on +/- percentage but within 5%, human ears aren't going to hear a difference. Explain how a 2 ohm, 5% tolerance resistor can measure 2.5 ohm just because it is mounted in a speaker? You logic is confusing at best. Are you telling me that when I order a 2 ohm resistor that when I mount it on the crossover board, it will magically change to a different spec? Just measured a 22.5 ohm resistor...on a crossover board...it measured 22.53 ohms...which is within tolerance for a Mills MRA12...so where is this magical resistance chance happening? All I was trying to say, is that the stock components often measure different than their labeled values. I have not measured any huge variations, but read a few threads, where variations were far larger than the 5-10% Variances labeled on the Stock parts. That makes WAY more sense than your original postulation. Measuring that same 22.5 ohm resistor in the stock circuit does show a greater than 5% tolerance. But I would also expect that considering that part has an unknown life over the last 24ish years and has clearly degraded over time. Putting a new component in the circuit isn't really trying to replace it with a different value per say as much as it is returning the circuit to its original specs. 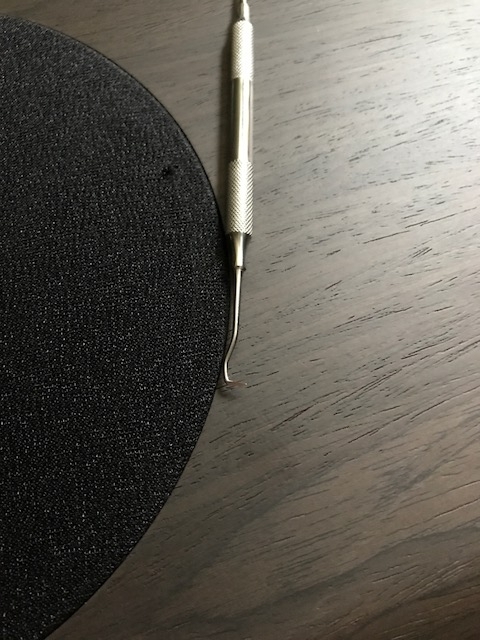 I read through some posts here and saw "dental pick", so I thought GREAT idea, and bought a literal dental pick. I see now that's not what people use. Turns out, it worked really well, especially for prying out the old driver. No cabinet damage and I didn't have to unscrew the bottom plate to push the driver out. I just lifted it right out. I have the newer version and the grill on one speaker was so stuck on, my wife insisted that it must be glued in place. It finally came off but not without a pea sized hole in the grill cloth. Unfortunate, but this grill cloth is fragile and there really was no other way to get it off. The second grill was more loose and came out with just a tiny hole from the dental pick I used to pry it out. This hole is much more tolerable. Grills are not forever, especially the stuff they used on this series. I did not like the idea of mortite or some kind of messy caulk gasket. I saw someone mention cutting the DB gasket and that's what I decided to do. I used a razor blade for all the trimming. First, I cut the gasket in half, as in I inserted the blade where the driver had been and cut along the circumference of the circle so I had two circle gaskets (frontal plane, I guess?). The top part has some decorative ridges in it, so I used the bottom. There was a small ridge on the outer rim, which I trimmed off. To get this gasket to fit into the hole, I cut it again (sagittal?) so that I could lay it in the hole and overlap an area where I cut. The overlap was trimmed off. This allowed me to align 3/4 of the holes with their original position. It also kept the driver in the original position instead of pushing it farther out. I replaced the four screws that were there originally and added 4 from the DB840. I used an impact drill and the screws went in like butter without any pre-drilling. 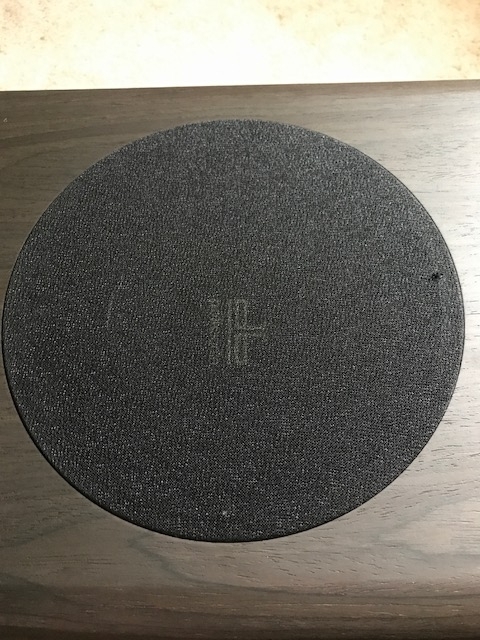 The VC on the woofers I got was at the bottom based on logo orientation. If mounted with the logo up, the wires were smashed against the port and I didn't want any lose wires dangling around right by the port. So I decided to invert them and just leave the logo upside down. No one is going to see it, so I don't care at all. I'd rather that than risking buzzing wires inside the cabinet. My port didn't seem like cardboard. It was hard and rigid. I decided not to bother with the dynamat. Since I didn't use mortite I can always pop the driver out and add it later, but for now I left it out. The bass is instantly tighter. I would go as far as to say I disliked the bass from the original speaker. It was sloppy and that makes sense once I got to feel the flimsy driver compared to the stiffer DB. Bass is slightly deeper but not too much. Mostly I was after tighter more controlled bass. That's what I got. For those with grills that are in way too tightly, you should be prepared to ruin them or at the very least, puncture the fabric and have a hole. The only way to get the tight ones out is by pulling from underneath (as far as I can tell). I feel like I've made a power hungry speaker even more power hungry. This is anecdotal of course. What about a DB1040 SVC for an LSi25? Airplay zones: Family Room (HDMI), Master Bedroom (Optical), Office (HDMI), Living Room (Optical), MA5200 (Optical), SR7009 (AVR direct) and Patio (analog). MacMini iTunes multi-stream to any, combo or all. Hard for me to say. The engineers at Polk were the ones who did the work to find out the sub was a great drop in replacement. I don't think they tried it with Lsi25s. The subs seem cheap enough where you could get them, try them out and return them if you didn't like them or dump them on craigslist. Hey gang, I have followed this thread for years and, considering its age, dont feel too dumb by keeping it going to ask a question now. I have loved my 15s for many years, but the one nagging thing about them (to me anyway) was the upper bass rolloff. I could never really smooth it out so I just set the receiver to a high crossover, and handed most of the work to a pair of 10" Hsu subs. That helped quite a bit. I listen to a lot of light strings and female vocals, so deep extension has never been a real priority in lieu of smoothness. So just recently I was considering selling the speakers just because it has always seemed like a bandaid fix. 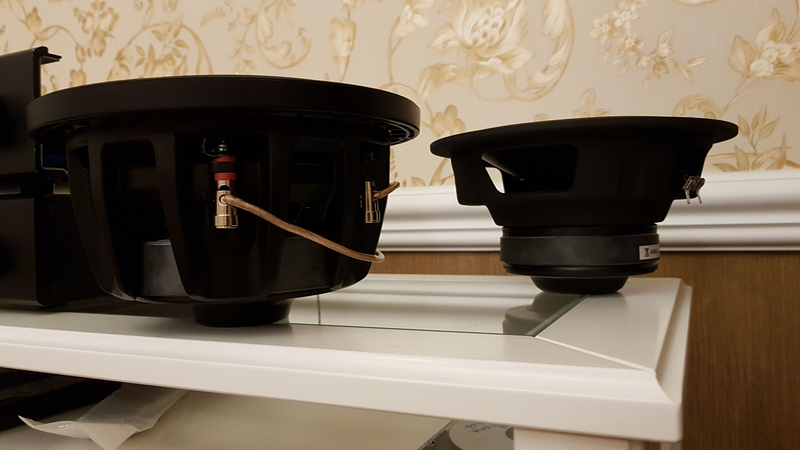 Burning question now to is have you guys found the upper woofer crossover smoother with the replacement woofer? Or is this a complete replacement crossover thing? On another note at the other end of the frequency spectrum (and unrelated) the highs seem 'capped' for a lack of a better word that I can come up with. That one I can live with for now though. The mod, involves changing the side mounted woofer (8") that has a decent bit less upper bass boominess. It is a great change "IF" this particular issue bothers you. It can be also helped by doing what you do, crossing a sub fairly high, and adjusting the level to your preference. There are ways to mod the crossover to also remove the "issue" of bass boominess also. Not sure how to answer about the "highs", they seem fairly good as is, but not too forward like many speakers are voiced. Thanks K_M, The highs shouldnt have entered the picture here as its not the topic. My mistake. Your description was enough for me to give this a try. I find the small Hsus blend nicely at the bottom, so that area of midrange is the only 'in my face' problem that I have that I was never able to fix. I found the mod helped with what I perceived as boomy bass. Extension is better, impact is better and the speaker sounds better when run full range. For HT they're crossed at 60hz so they really aren't doing much but for music, the full range abilities help out. I prefer not to use my sub with music unless I'm trying to annoy the neighborhood for fun. I find it to be a more cohesive speaker. I also figured that for $80, if I didn't like it, I hadn't wasted much. Just registered here to say that although the DB840 upgrade does make the LSi15 bass sound tight and nice, the MM840 sub destroyed the DB840 in my LSi15s with modded crossovers. Whereas the db840 makes the bass tight, the mm840 takes the bass even deeper, punchier, more dynamic and even thunderlike. I'd recommend anyone considering db840 swap to try mm840 as well. Make sure you use all 8 screws to make sure your mighty mm840 is secured tight in there. I should note that the crossovers in my LSi15s are modded, this is yet another way to make your LSi15s sound much better. Just in case, I drive my LSi15s with a pair of fully modded Adcom GFA-565 monoblocs. Now that DB840 is discontinued and hard to find, anyone have an opinion on using the new DB842? Quick look at the specs show it's slightly shallower (within 10mm), but slightly wider by about 5mm (179.4mm old vs 185mm new). Will there be an issue getting the larger subwoofer to fit in the LSi15 enclosure? 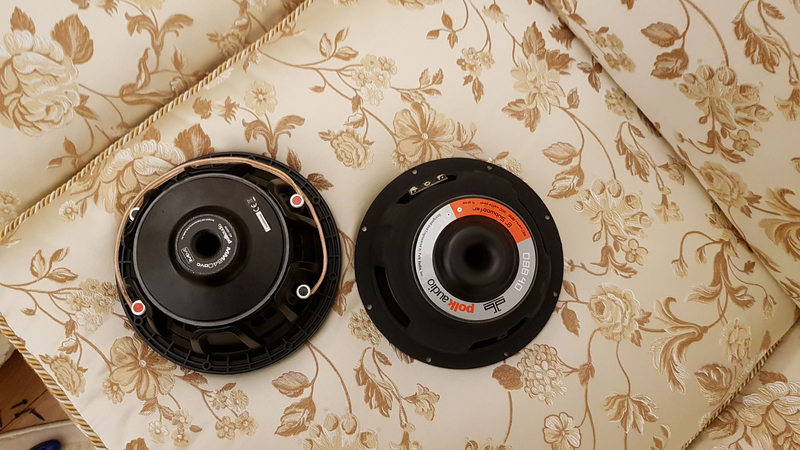 Having used the DB840 in your speakers, do you think the increase in diameter will be an issue or is there some wiggle room? It's nominally 5.6mm larger according to the documentation. I'm not too sure. There might be enough room to fit the driver in the cutout of the wood paneling but maybe not in the MDF enclosure underneath. Check out the post on page 5 from mesquitehead. In his picture, you can see how much space there would be. I still think the easiest way to find out is to just grab one from Amazon and try it out. If it doesn't work, Amazon is very easy to return things. Just picked up a set of LSi15/LSiC to replace some RTi12/CSi A6. Already put in an order for the Fotress upgrade for all three and would love to see some update on the sub swap using one that can still be found in stock. In use: Polk LSi15s (sub upgrade), LSiC, LSi9s SVS PB 10 ISD connected to Onkyo TX-NR777. VR3 crossover upgrades ordered for fronts and center. I had collected a as many Polk car sub parameters as I could find (see attachment). It gets a little confusing as there are some contradictions between what was on the web vs what was in the spec sheets. Well, the DB842 SVC arrived today. Was able to take the cover off the old sub with help of a plastic spudger kit. It was glued in but once you get a small section to come out you can just grab it with your fingers around the edge and work it loose. Old sub came out easy enough. The DB842 fit right in, didn't have any clearance issues as far as I could tell and didn't have to mess with the plastic ring on it. Just used the original 4 screws for now. I have a MM842 arriving early next week and I'll try that one out in the other LSi15, and see which sounds better (if it also fits). Great, please keep us posted. I am debating between DB842 and MM842 as well.